Alchemist is a start-up fuel saving technology company, that lowers harmful emissions and improves performance. We were approached to help them launch their brand at the Commercial Vehicle Show at the NEC. Whilst an established logo was in existence, there was no corporate identity. With a deadline of just 6 weeks until the show, there wasn't the option of going through a brand identity project, and so the decision was made to explore and establish the brand visual through the design & creation of their brochure. Taking the key colours of red, white and blue from the logo, we expanded upon this to create a bold and distinctive visual language. 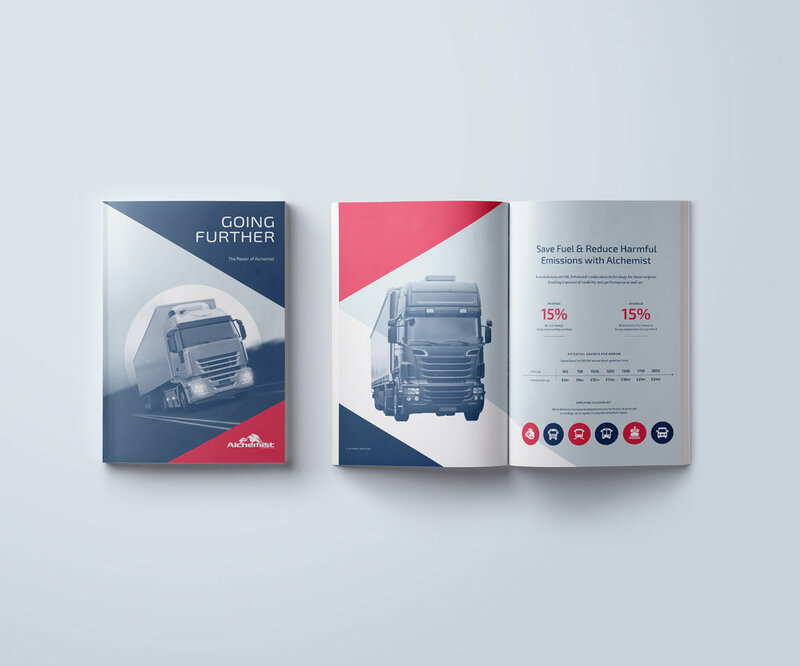 For the brochure, dynamic graphic cuts across the pages represented the cuts to emissions and fuel costs; whilst bold colour washes transformed otherwise unattractive, industrial imagery into beautiful compositions. As well as the design, we specified the print stock and managed the print process. Although this particular design was for print, careful attention was paid to the other required applications, ensuring consistence could be maintained. Next, it came time to expand the new identity to other brand materials. Hosting industry leaders and seeing around 21,000 B2B visitors at the NEC in Birmingham, The Commercial Vehicle Show was the perfect event to introduce Alchemist to the world. The design & layout of the stand was key. It was going to be imperative that there was clear messaging and recognition, as the busy environment would mean competition for attention would be high. The first step in the process was to plan out the space, incorporating all required items while maintaining a good customer journey through the space. To help communicate the plan to the client, we produced 3D visuals so that size and scale could be understood. With the layout confirmed, the new brand was applied to the plan and then put into production. A mixture of material wrapped graphics and foamex panels were created, along with a bespoke desk and screen space. Our team built the stand on-site, over the 2 days prior to the show, and also helped to manage the installation of Hannibal, the clients DAF truck which we also designed the livery for. We were tasked with creating digital assets for Alchemist too, including a single page fully responsive website and an html email template for digital communications. The designs were developed and applied to be in-line with the brand identity.